Delusion – fixed false belief that is resistant to reason or confrontation with actual fact. This series, American Delusions, describes important delusions, contrasts them with the facts surrounding them and explores how these delusions fit into a pattern that sustains the organization of our society in its present form. 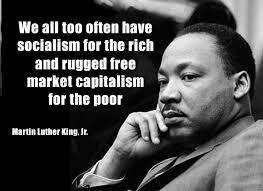 Free-market (neoliberal) ideology has dominated every aspect of American life for the past 40 years and more. It is a truly global ideology that is supported by global corporate and financial interests, implemented by many governments, some at the direction of local government and in many other cases driven by World Bank and other financial institutions’ policies.The mass media and education system reinforce free-market thinking in a comprehensive manner. Our culture is interpenetrated by the underlying concepts and rhetoric. Therefore we start with this topic and recommend it to you. Understanding the claims of free-market capitalism and developing a critical point of view will arm you for many of the other topics. I have been working on American Delusions for more than three years. You will see that there are posts dating back far earlier. I imagine that I will be still be working on these topics many years into the future.